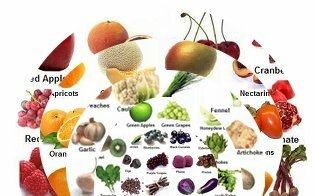 I created this huge list of fruits and vegetables so can you can make sure you're getting a large variety of nutrients every single day. Why does everyone always say to eat your veggies? Everyone knows that fresh fruit and vegetables are healthy, that they are low in fat, calories, and sodium, have no cholesterol, and are high in fiber. The fiber in vegetables and fruits helps fill you up so don't feel like eating more than you need, and it also helps move the digestive system along. If you eat a full diet with tons of fiber and drink water, you help your body to process the necessary nutrients and then remove the waste efficiently. Those nutrients help give you energy, detoxify from free radicals, cleanse your blood and keep it pumping freely through your body, keep your skin healthy, improve your immune system, strengthen your bones and teeth, and overall keep you healthy! But did you know that each group of colors has similar nutrients; red produce is packed with vitamin C whereas green produce has tons of vitamin K, and so on? That makes so much sense, but it absolutely blew my mind! If you eat something from each color with every meal (or at least by the end of the day), you've truly given yourself a balanced diet. This gives new meaning to the phrase "eat the rainbow." Do You Eat Enough Veggies? Did you know that the most consumed vegetables in America are potatoes, lettuce, and tomatoes? Most of us are eating far too little of these nutritious foods. If you can get yourself into the category of people eating the most vegetables and fruits, you will have the lowest risk for chronic diseases and you won't need to use supplements to eat a balanced diet. There are more than 12,000 phytochemicals (these are the chemicals that come from plants and provide color to the food) in nature, and eating fruits and vegetables, rather than using supplements, is the best way to make sure you are getting enough of them in your diet. Each color food has a different type of phytochemical that helps your immune system function properly. You can really pack a punch of nutrients with super foods, and I like to add them in as much as I can. No matter what you're doing right now, you can add more variety into your diet. I know it can be hard to come up with new ideas for foods, and so I wanted to provide some inspiration for all the beautiful and insanely delicious options you have for eating the rainbow, every single day. Shortly after I built this page, people started asking if they could download the pictures to use in their classrooms or at home, and so I created a pdf version that you can print yourself, as well as a poster version that you can buy at Zazzle. You'll see links to each below each photo. 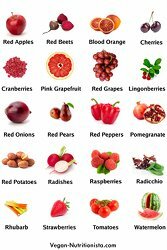 The main phytochemicals in red foods are anthocyanin and carotenoids , specifically lycopene. Lycopene helps reduce damage from free radicals in your body and it also prevents heart disease, cancer, prostrate problems, and reduces the skin damage from the sun. Red fruits and vegetables help memory function, urinary tract health, and keep your heart healthy. These foods are often very high in vitamin C, which helps encourage cellular renewal in your body. 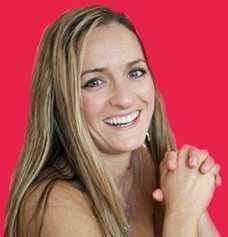 In addition to the power you get from the red foods, you also benefit from the byproducts, like vinegar, and specifically raw apple cider vinegar. Do you want your own copy of the red fruits and vegetables poster? Click here to purchase a 24 X 36 poster on Zazzle or click here to download the jpg file yourself. Carotenoids are the most powerful phytochemical in orange fruits and vegetables. 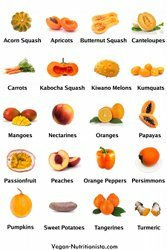 The darker and more vibrant the orange, the more carotenoids they contain. Carotenoids repair DNA and help prevent cancer and heart disease. Orange foods also give us ample amounts of potassium and vitamin A, which keeps our eyes and skin healthy, enhances our vision. We know oranges have good vitamin C, but so do all of the other orange veggies. You can boost your immune system by loading up on naturally orange foods. To buy a copy of the orange fruits and vegetables poster, click here to go to Zazzle or click here to buy the download and make your own posters. Naturally yellow foods are high in antioxidants like vitamin C, which keeps our teeth and gums healthy, helps to heal cuts, improves the mucus membranes (like when we have colds), helps to absorb iron, prevents inflammation, improves circulation, and therefore prevents heart disease. Some of the darker ones also cross over with the health benefits of orange foods. 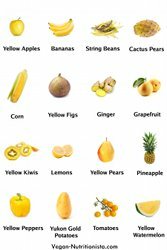 You can purchase the yellow fruits and vegetables poster on Zazzle here or click to download a jpg file for yourself. The two main phytochemical in green fruits and vegetables are sulforaphane and indoles, which both prevent cancer. 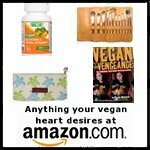 They are also good for the circulatory system and have good vitamin B and minerals. The vitamin K in green foods also helps with vision, and with maintaining strong bones and teeth. Some of the yellower green vegetables have carotenoids lutein and zeaxanthin that help to prevent cataracts and eye disease, as well as osteoporosis. Dark, leafy greens can almost be put in a category by themselves because they're so packed with nutrients. In addition to the above, they're loaded with antioxidants, anti-inflammatory properties, sun protection, and can even be called anti-aging. They're also a great way to get folate into your body, the B vitamin you hear about when you're pregnant because it helps prevent birth defects. It also helps detoxify and repair DNA and support gut health. Eat dark, leafy greens every day! The base of a GOMBS diet is the dark leafy greens, and it helps to prevent and treat degenerative diseases like cancer, heart disease, and Type-2 diabetes. 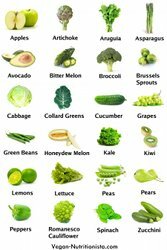 Here's the green fruits and vegetables poster on Zazzle or click to buy the jpg file so you can create your own poster. ﻿The predominant phytochemical in whitish/greenish vegetables is called allicin, which create an anti-bacterial, anti-fungal, and anti-viral chemical environment in your body. 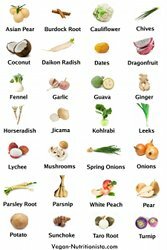 Some white foods prevent cancer and heart disease, and lower cholesterol levels. Interestingly, we often think of celery as a useless vegetable because it has no calories, but it does have minerals like sodium that helps to keep our joints healthy. Mushrooms are similar- you might not realize they're healthy, but they're packed with selenium, which helps to prevent cancer and keeps your body in balance. Everything on this greenish/white list of fruits and vegetables helps maintain low cholesterol levels in your body as well as a healthy heart. To get your copy of the white fruits and vegetables poster, click through to Zazzle or click to buy a download file in pdf format. The blue, indigo, and violet list of fruits and vegetables are great for their anti-aging properties. These foods have tons of antioxidants, specifically anthocyanins and phenolics. Some blue and purple fruits and vegetables are also really high in vitamin C.
Anything in this category will help improve circulation and prevent blood clots, so they are great for the heart and can help prevent heart disease. They are also known to help memory function and urinary tract health and to reduce free radical damage. 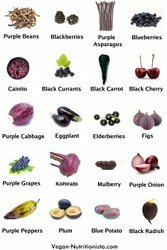 And last but not least, if you want a poster of the blue and purple fruits and vegetables, click here or buy a jpg file of the poster here. I hope you've enjoyed our list of fruits and vegetables.